One of the newest buildings in Bangkok is Park Ventures, a beautiful structure that has opened on the corner of Ploenchit and Wireless Roads. The builders have marketed Park Ventures as “Bangkok’s first eco-plex” – whatever that means. Perhaps more green-washing than reality or maybe a legitimate stab at reducing the carbon footprint of the modern office building, hotel, and retail complex. That said, I was bemused by the steps leading from the footpath to the main lobby. They are marked with the number of kilocalories one ostensibly burns with each step. 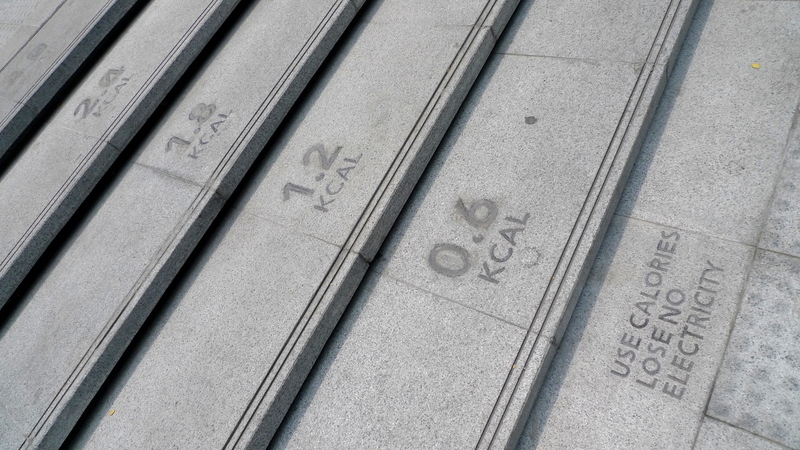 Looking at the progression – 0.6 kilocalories per step – it looks like the fourth step may have been corrected from 2.0 to 2.4. (That may just be an optical illusion from this angle, though.) Best of all is the Thinglish admonition: “Use calories lose no electricity.” Perhaps they meant “waste”? This entry was posted in Uncategorized and tagged Calories, Ecoplex, Energy, Environment, Greenwashing, Park Ventures by christao408. Bookmark the permalink. I have lots of catching up to do on your blog. I skimmed through the lychee pie (I never thought of that before), the earthworms, the Korean restaurant, the pub…. If someone goes down the stairs, do they gain weight? @ElusiveWords – You made my day with that joke, Matt. Matt has been working too hard you have to excuse him – but that is a good question. Now that’s a good approach.Thank you for sharing! hehe! I like that idea! I’m going to suggest the “sustaniability committee” do that in all the buildings to encourage exercise! That’s genius. It would definitely make me take the stairs… but wouldn’t someone who is more mass-heavy burn more kcals than somebody who is more slender? That’s somewhat nice and encouraging. I think they need to do something similar for all the stairs in our subway stations and such here. Something as simple as “step 1 of 342.5” would make me want to take the stairs more than a boring bland escalator. Is the sign on the first step engraved in concrete? Yes, I too think they meant “waste”. That’s a new one on me. 0.6 kcal per step? I doubt it. This is not scientific. I’ve done the calculations. Suppose the person weights 60 kg (about 132 pounds) and each step is 0.5 foot (0.152m) tall. It should be 0.022 kcal per step, not the 0.6 kcal as shown in the photo.